Qube! 6.5’s new cumulative time-tracking option. Developer PipelineFX claims that better cost-reporting features in its renderfarm-management system help turn a “money faucet” into a clean, efficient pipeline. 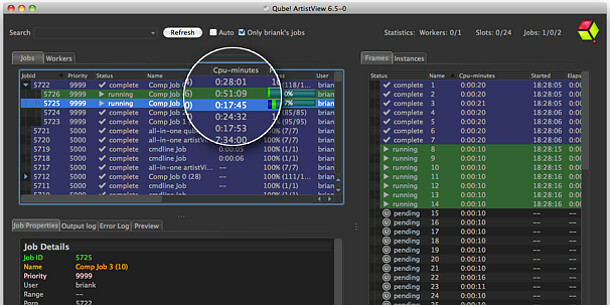 PipelineFX has released Qube 6.5, a free update to its renderfarm-management system that makes a direct appeal to a studio’s bottom line, rather vividly describing an inefficient pipeline as a “money faucet”. The tools the update provides to address the issue – better job tagging to tie farm usage rates more closely to invidual clients, more sophisticated time tracking, and the like – are rather more prosaic, but it’s certainly a more compelling metaphor than you usually get with systems of this type. Qube! 6.5 is available now for Windows, Mac OS X and Linux. Per-site pricing begins at $3,500: you can find more details in PipelineFX’s FAQs. PipelineFX, creator of the leading render farm management software for digital media creation, announces the release of Qube! 6.5. New tools for job tagging, configuration, and reporting round out Qube!’s most feature-rich offering to date; while improvements to Smart Farming functionality promote a simpler path to pipeline intelligence. During this development cycle, PipelineFX tackled two areas that will bring immediate results to their customers. The first: detailed cost reporting for firms that manage rendering across multiple shows and clients. The second: an increased ability for larger studios to minimize supervisor downtime and easily re-configure their render farm as situations and usage rates shift. Customers currently on subscription can download version 6.5 immediately from the PipelineFX FTP site. PipelineFX introduces metered licensing for Qube!